On Christmas eve, John McClane (Bruce Willis) is waiting at Dulles international airport in Washington D.C. to pick up his wife, who is flying into town. However, while he is there, terrorists take over the airport's computers and hold the planes flying overhead hostage until their demands are met. McClane now has to offer his assistance in dealing with another set of terrorists over the Christmas holiday. The original "Die Hard" is the greatest Christmas movie of all time. You're either on our side or you're wrong. As we know by now, any damn time a film as beloved and as profitable as "Die Hard" was means Hollywood will make an attempt to cash in by making a sequel if at all possible. This, of course, brings us to "Die Hard 2." Renny Harlin takes over the directorial duties for this sequel with a very familiar plot. Yet again, this film takes place at Christmas time, and now, the setting has been changed to Dulles international airport instead of Nakatomi Plaza. A group of mercenaries led by Col. Stuart, played William Sadler, takes over the Dulles airport computers and holds any and all incoming planes hostage so they can free an incoming war criminal named General Ramon Esperanza, played by Franco Nero, who is being transported as a prisoner to the states. Of course, John McClane, again played by Bruce Willis, is there waiting to pick up his wife Holly, again played by Bonnie Bedelia, who becomes a hostage on one of the planes circling overhead. John takes it upon himself to get involved in trying to bring down these terrorists whether airport security wants him to or not. 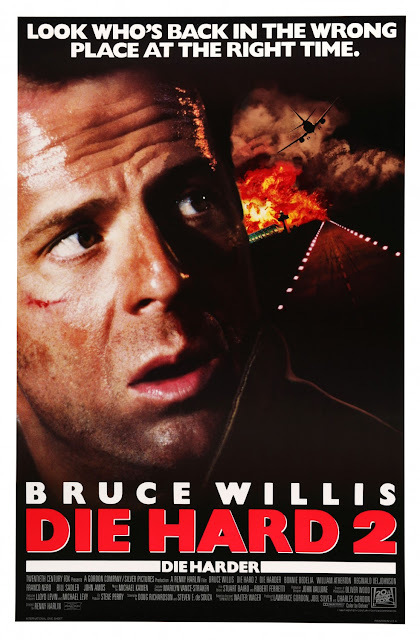 Despite having a lot of similar qualities to the original, enough has been changed to make "Die Hard 2" feel somewhat fresh, even if it's not as good as its predecessor. Bruce Willis is as charming as ever and he still offers up some great delivery of his action movie one-liners. There are many awesome action sequences throughout the film with the type of violence you would expect from an R-rated action flick of this era. The filmmaker does his best to make these scenes more intense and have everything seem like higher stakes. However, even though William Sadler is fine and is written to be a more physically imposing villain character, he lacks the gravitas that Alan Rickman had as Hans Gruber. It's just not Christmas without Rickman's portrayal of the calm, stoic, hardened, and badass Gruber. Good god, we miss that man. That being said, "Die Hard 2" is still a fun and exciting action sequel that will keep you mostly entertained so long as you forget how similar it is to the incredible original. Last Christmas, we were watching: "Silent Night, Deadly Night"
Two Christmases ago, we were watching: "Santa's Slay"
Three Christmases ago, we were watching: "Arthur Christmas"